The egg white saga goes on: what to do with all those poor egg whites left from the almost insane ice cream making going on in my kitchen? I did bake a batch of meringues last Saturday, but they ended up in the garbage can. 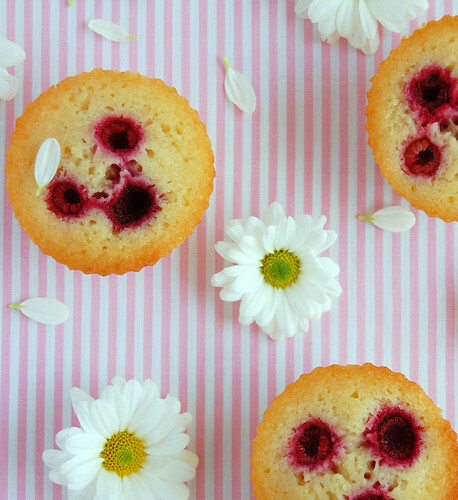 I’m glad Julie Le Clerc’s adorable book was around – these friands are delicious. Preheat the oven to 190°C/375°F. Butter well 10 mini cake or muffin pans. Place the butter, ground almonds, egg whites, vanilla, icing sugar and flour in a large bowl and stir just until combined. Spoon the mixture into prepared pans – they should be just over ½ full. Top each friand with 3-4 raspberries. Bake for 25 minutes or until golden and a skewer inserted in the center comes out clean. Allow to stand in pans for 5 minutes then turn out onto a cooling rack. yum, they look absolutely delicious! You could also make up some swiss meringue buttercream for any cakes/cupcakes with all of those eggwhites. Also maybe some egg-white scrambled eggs? 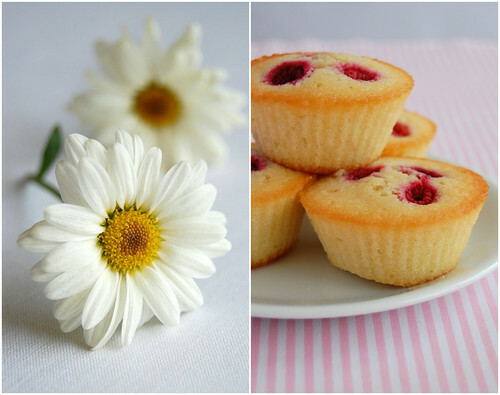 These friands are so beautiful! Plus, I adore friands and the flavours in yours - delicious. Those are beautiful! It looks like it has a face in it. I like berries so much that I can't wait to try some! Alicia, you are right - I'll keep that idea in mind, tks! Lucy, berries are the best, don't you think? I love almonds and berries and these look fabulous. I've never had a friand before and would be curious to try it. I make angel food cake when I've got a lot of spare eggwhites kicking about...It's really yummy and I feel less guilty eating several pieces of that than friands. thank you for this lovely recipe...it peaked my interest & this afternoon i baked these little gems!! sheer perfection & not too sweet...the raspberries did the "talking" & the ground almonds gave the friands a wonderful texture! patricia, wishing you a joyous 2010! Linda, I'm so glad to know the recipe worked out for you! Thank you for letting me know - have a wonderful 2010, too!